Wyoming’s booming energy sector has intensified considerably in the last decade, which has translated into a critical need for hotel rooms. U.S. oil and gas industries have gravitated to Wyoming’s vast stores of natural resources in recent years, heightening their activities and increasing their workforces in the state. Although operations have proliferated, facilities to accommodate the population influx remain too scarce, priming certain regions of Wyoming for a lodging boom. The western portion of Wyoming is reported to house the largest known reserve of methane gas in the world, while coal deposits in the northeastern portion of the state supply more than one-third of the nation’s coal. These reserves exist in a state with a small population, at 515,004 in 2006; furthermore, the reserves are located in areas far from the state’s two largest cities of Cheyenne and Laramie, with respective populations of 55,314 and 25,688 in 2006. Wyoming is the least populated state in the U.S., having even fewer residents than the District of Columbia. Natural resource exploration in the state has prompted a population surge and the beginning of a transformation of the state’s lodging industry. Geologic formations within Wyoming's Overthrust Belt fuel profitable production of natural gas. The massive methane deposits found there have prompted plans for a multi-billion-dollar network of pipelines in the state. The majority of the natural gas mining and pipeline growth is occurring in the neighboring counties of Sweetwater and Sublette. Sublette County contains the majority of the natural gas deposits, while Sweetwater County and the cities of Rock Springs and Green River serve as gateways to the reserve areas of Wyoming. Sweetwater County contains two coal power plants, the Jim Bridger Power Plant and the Black Butte Coal Company. These massive power facilities are major providers of electricity to the western United States. The Jim Bridger Power Plant is expected to add an additional electrical generating unit to its four existing units. According to Patricia Robbins, Director of the Sweetwater Economic Development Association, the project is in the feasibility phase, and if approved would create approximately 2,500 temporary and permanent jobs plus an additional 500 jobs once the new unit is fully operational. A recent report cites that the natural gas industry employs one out of every two workers in Sublette County, and one out of every two dollars spent in the county comes from the industry. The Bureau of Land Management expects the industry to grow yet another 20% to 30% by 2010. This unprecedented growth in Sweetwater and Sublette Counties has prompted critical needs within the housing sector, a situation that the cities of Rock Springs and Green River, with over 33 residential subdivisions currently under construction, are striving to address. Unemployment in these parts of Wyoming has fallen dramatically in the past decade, concurrent with the rise in energy industry activity. This activity is generating unprecedented occupancy levels in these regions due to a limited lodging infrastructure and the prohibitive distance from the state’s major population centers and established room supply. Companies have even gone so far as to build their own lodging facilities given the lack of suitable hotels proximate to their operation sites. 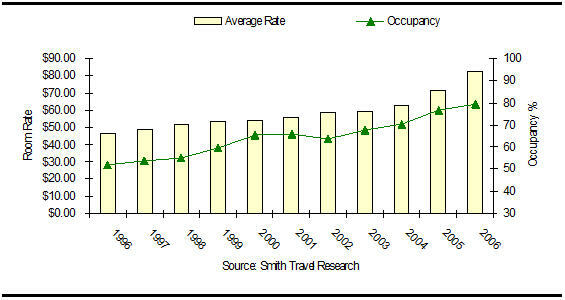 Occupancy and average rate in the southwestern Wyoming market have been steadily increasing since 1996. New hotels have easily been absorbed, as the market sells out almost one-half of the year; year-to-date, occupancy for the stronger branded properties has remained well above the 85% mark. The market is busiest on weekdays, which in turn commands the highest rates. Weekend occupancy remains strong, as activity in the region is prevalent seven days a week and extended-stay demand is high. 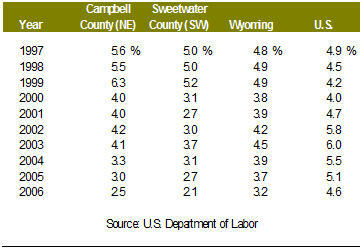 Occupancy and average rate in the northeastern Wyoming market have experienced a similar upward trend. The market sells out seven days a week throughout the summer months, and hotels that entered the market several years ago have already been absorbed; year-to-date, occupancy has remained above the 70% mark. The summer months command the highest average rate because of the heightened levels of travel during this season. Only two new hotels are presently under construction, and these are expected to be easily absorbed upon opening. 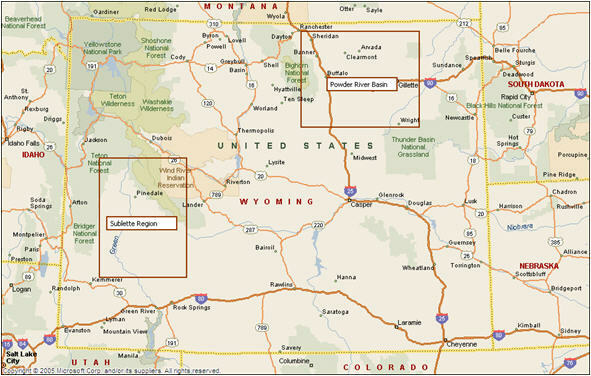 Wyoming’s energy corridors have emerged as the largest natural gas and coal mining and development areas in the United States. The state has seen an increase in population and commercial development because of this growth, particularly in Sweetwater and Sublette Counties and the Powder River Basin. 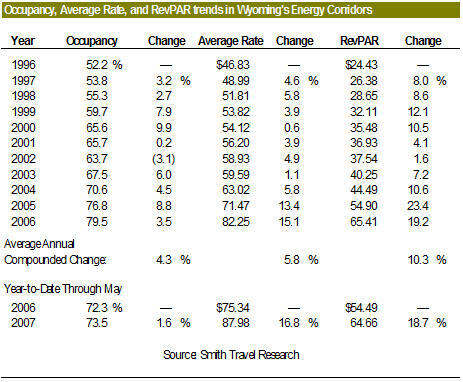 Lodging trends in these energy corridors have been increasing for over a decade, and most recently, hotels have reached critical capacity. Moreover, while the pipeline for new hotel construction is starting to gain momentum, the hotels being built are relatively small and should be easily absorbed into their respective markets. In sum, natural resource-related operations in Wyoming have paved the way for a lodging boom, and an ever-growing workforce anxiously awaits new supply to meet the demand. Gearino, Jeff. “Expansion planned at Bridger power plant” Casper StarTribune.net 6 (2006) June 2007. Dear Ms. Flanary, I really enjoyed this article, but am wondering if it is still true. I live in Pinedale and am noting a marked slowdown and also uncertainty in the gas extraction industry with the general global economic uncertainty, but also with the DOI (Dept of Interior) policies under a new administration and their decision not to release leases in our area. What are your thoughts? Thank you in advance for your time in answering these questions.